The Jewish leaders still refused to believe the man had been blind and could now see, so they called in his parents. They asked them, "Is this your son? Was he born blind? If so, how can he now see?" His parents replied, "We know this is our son and that he was born blind, but we don't know how he can see or who healed him. Ask him. He is old enough to speak for himself." 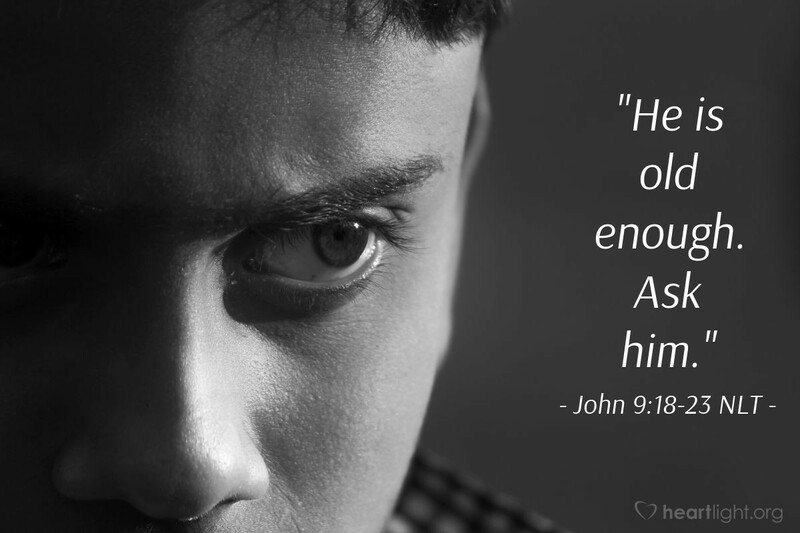 His parents said this because they were afraid of the Jewish leaders, who had announced that anyone saying Jesus was the Messiah would be expelled from the synagogue. That's why they said, "He is old enough. Ask him." While many parents are conscientious and dedicated to raising their children in the Lord, unfortunately, there are also some parents who view their children only as mere biological products. Their tie to their children is simply genetic, neither spiritual nor emotional. That's the kind of parents the healed man had. They were more concerned about their place in the synagogue than with their son's healing and spiritual development. They leave their son on his own to defend himself and to fend for himself. As God's people, we must remember his heart for the orphaned and abandoned, and we must defend and care for them as God's people. We must care for our own families as well as those people who are abandoned and alone. Holy God, please help your people as we seek to care for the abandoned and helpless. We are horrified at some of the terrible things done to children in our world. We pray for courage to step forward and help protect them and for compassion to care for them personally. In Jesus' name, and to his glory. Amen.